Monday November 22nd 1926 I wrote a letter to Warner McCall and sewed some in the forenoon. I rode down town with Rob & Cora. I was getting my hair washed. Brought home a couple of hats to select one. Came by taxi. We dressed as quickly as we could and Rob took us to the Red Ball Inn to the Shakespeare Club party. It was a delightful evening, so much fun and sociability. Fred Stevens brought Hattie & me home. 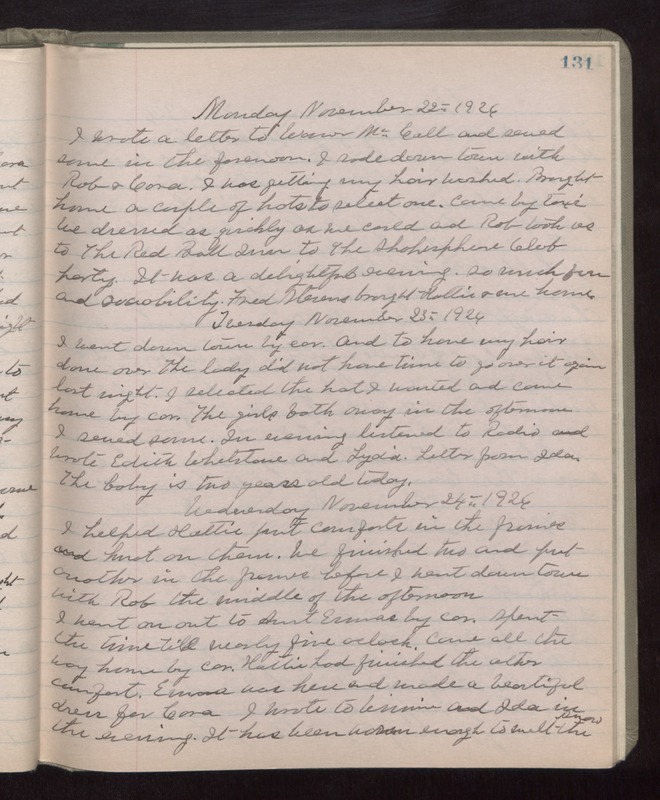 Tuesday November 23rd 1926 I went down town by car. And to have my hair done over. The lady did not have time to go over it again last night. I selected the hat I wanted and came home by car. The girls both away in the afternoon. I sewed some. In evening listened to Radio and wrote Edith Whetstone and Lydia. Letter from Ida. The baby is two years old today. Wednesday November 24th 1926 I helped Hattie put comforts in the frames and knot on them. We finished two and put another in the frames before I went down town with Rob the middle of the afternoon. I went on out to Aunt Emmas by car. Spent the time till nearly five oclock. Came all the way home by car. Hattie had finished the other comfort. Emma was here and made a beautiful dress for Cora. I wrote to Winnie and Ida in the evening. It has been warm enough to melt the snow.